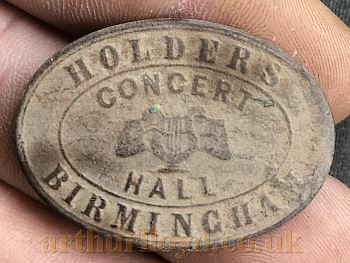 Holder's Grand Concert Rooms, 88, 89, 90, Coleshill Street, Birmingham. 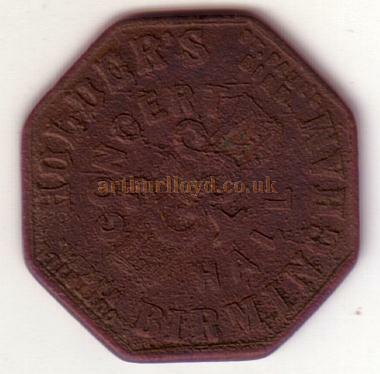 It was known as Holders Hotel and Concert Hall on its opening but would later become Holder's Grand Concert Hall eventually accommodating some 2,500 people. 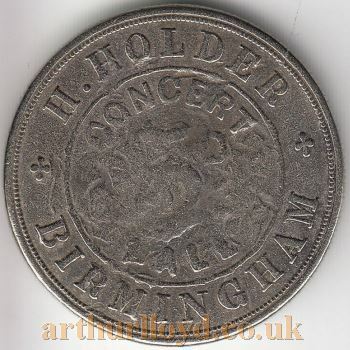 It had many changes of proprietors during its time including Soward and Gardner who took over in 1863, John Soward junior in 1867, John Judd and Company in 1871, who changed the name to The Birmingham Concert Hall, and Phillips and Chowles who took over in 1876. 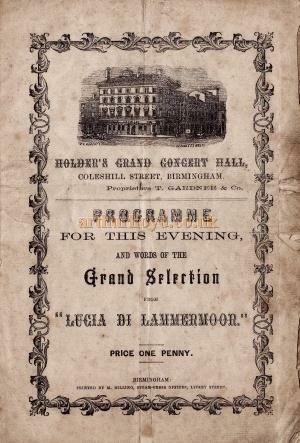 Right - A programme for Holder's Grand Concert Hall during the management of T. Gardner & Co between 1863 and 1867. On the Bill were Miss Crosley, Mr. Arthur Lloyd, Lawrence & Manning, Mrs. Mears, and Miss Smythson - Courtesy Ian Gibb whose G G Grandmother was Mary Ann Mears, who appeared on the Bill of this programme - Click to see entire Programme. 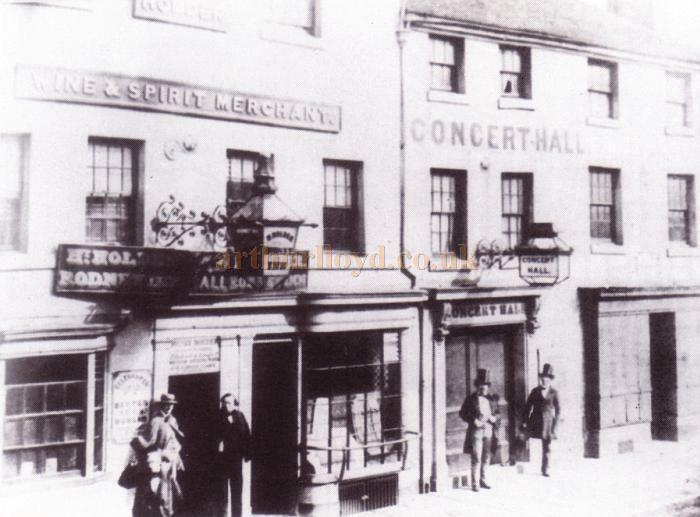 In 1886 Charles Barnard became the proprietor, and changed the name, to the Gaiety Concert Hall. 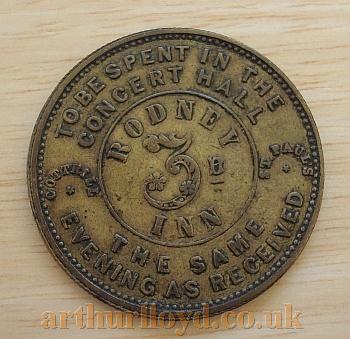 Arthur Lloyd is known to have performed at Holder's Grand Concert Rooms on several occasions and also in its later incarnation as the Gaiety Theatre of Varieties. You may like to read this Interview with Arthur whilst he was at the Gaiety in 1890. 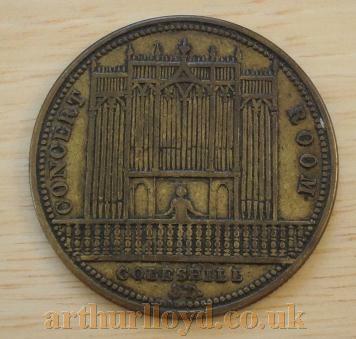 Since creating this page a great many early Entrance Tokens for the Concert Hall have been sent to me, which can be seen above and below. Above - A Token for Holder's Concert Hall, Birmingham which reads:- 'To Be Spent In The Concert Hall The Same Evening As Received' - Kindly Donated by Dylwyn Colbourne who found it in a field in Alrewas, Staffs whilst metal detecting. 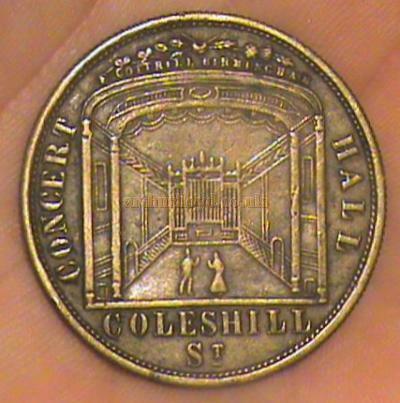 Above - Both sides of an entrance token for Holder's Concert Hall, Birmingham with H. Holder's name on the front - Courtesy Lynn Stratton. 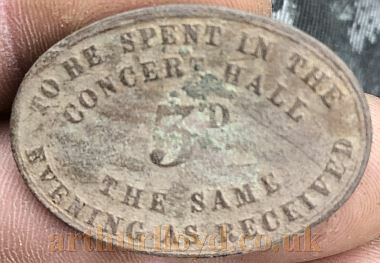 Above - Both sides of an entrance token for Holders Concert Hall, Birmingham - Courtesy Niall Morris who found the token whilst Metal Detecting in a field in the Midlands. 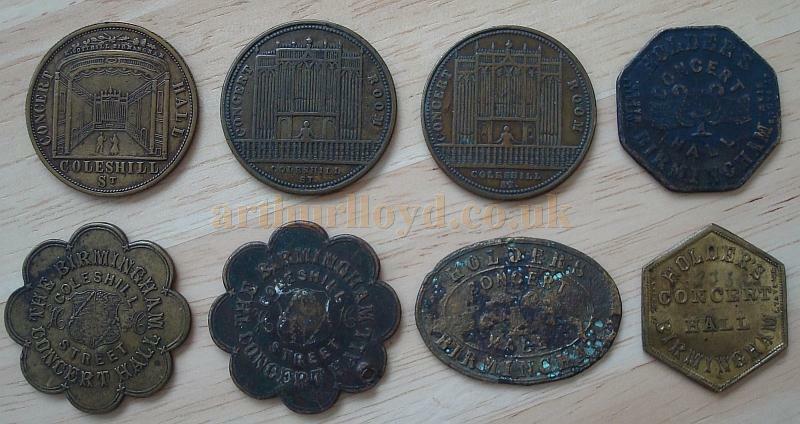 Above - The front and back of eight Music Hall Tokens from Holder's Grand Concert Hall, Birmingham - Kindly sent in by Lynn Stratton. 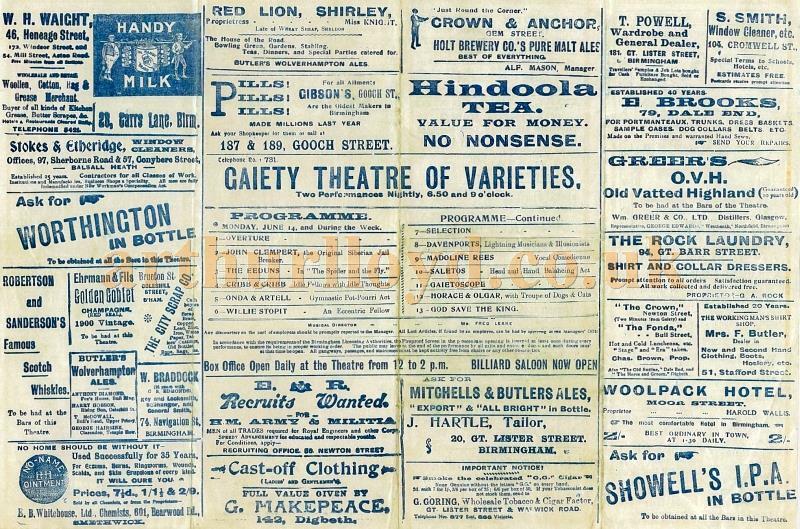 Above - The Gaiety Theatre of Varieties, Birmingham - From the opening night programme, printed on silk, for the 8th of November 1897 - Courtesy Lynn Stratton - (See cast details below). In 1897 the old Concert Hall was reconstructed by S. A. Davidson and A. R. Dean of Birmingham at a cost of £30,000, to the designs of the architects Crouch and Butler, and William Hope. The ERA reported on the reconstruction in their 25th of September 1897 edition saying:- 'The New Gaiety Palace, Birmingham, is arising Phoenix like out of the ruins of the old building, which has been partially demolished to make room for a new and more sumptuous edifice. Some £30,000 is being spent on the new building, and every effort is being made to make it one of the finest concert halls in the kingdom. The above text in quotes was first published in the ERA, 25th September 1897. The Theatre reopened as the Gaiety Theatre of Varieties on Monday the 8th of November 1897. 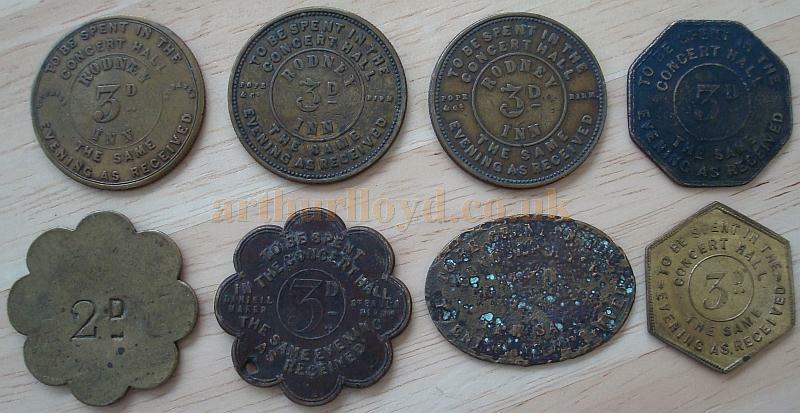 Seat prices on its opening were one shilling for tip-up chairs in the Dress Circle and 1s 6d for tip-up chairs in the Stalls, and altogether it was stated that the Theatre could accommodate some 3,000 to 4,000 people. 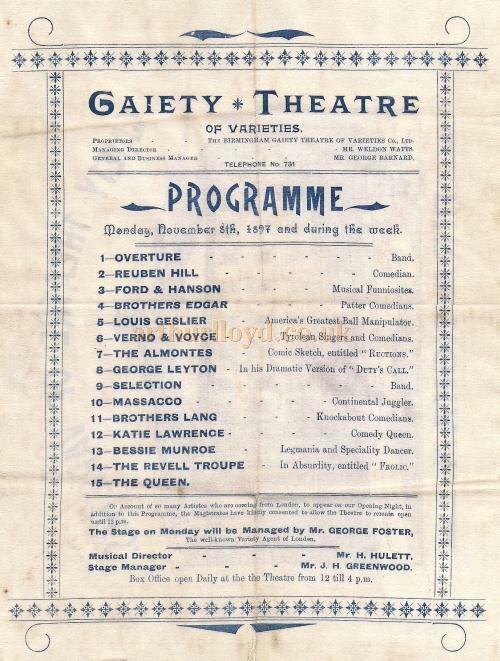 The Gaiety Theatre opened with a variety show including artistes such as Katie Lawrence, the Brothers Edgar, Ford and Hanson, the Brothers Lang, Verno and Voyce, Reuben Hill, the Almontes, George Leyton, Massaco, Bessie Munroe, and Louis Gaslier. 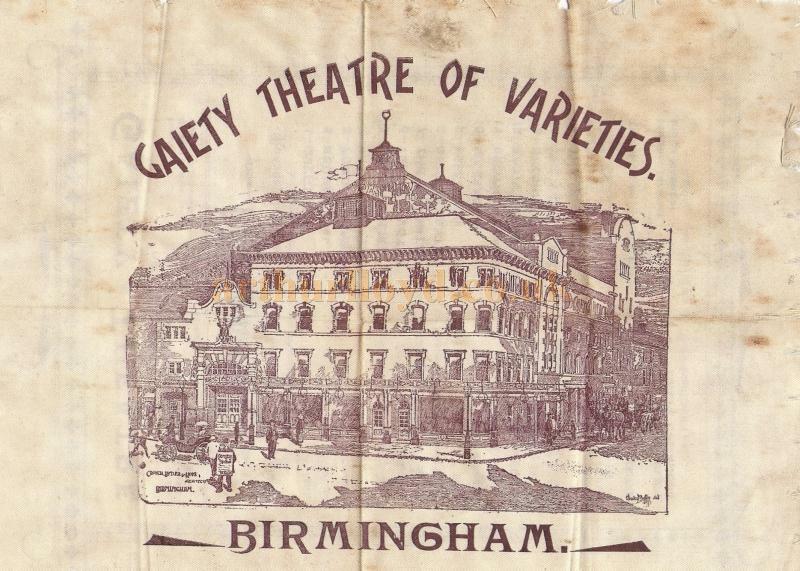 Right - The opening night programme for the Gaiety Theatre of Varieties, Birmingham, printed on silk, for the 8th of November 1897 - Courtesy Lynn Stratton. The ERA reported on the opening week of the new Gaiety Theatre, Birmingham in their 13th of November 1897 edition saying:- 'The opening week at the New Gaiety Theatre has been an unqualified success. The building was described by The Era last week. The assembly at the opening ceremony on Monday was a brilliant one, and the house was filled in every part. The band played the National Anthem, the audience rising, and then Mr Weldon Watts, the managing director, came forward and made a neat little speech. He said: - I sincerely trust you are pleased with the changes which we have made. It is the mere beginning of a new departure - a departure which I have made in other cities throughout the country with great success. We have provided you with a first-class theatre, and we intend to give you a first-class entertainment at reasonable prices. We give you tip-up chairs in the dress-circle for a shilling; tip-up seats in the stalls, which are second to none in the country, at 1s. 6d. We intend to give you, as we have given you a fine theatre, an entertainment in keeping with the theatre. I have to ask you to bear with us for any omissions which you may notice to-night, and you must not judge from what you see to-night of what we intend to do in the future. As you are aware, we were very much handicapped in getting the building ready for the opening, and we had to cut down to a very great extent the bill which we had intended to give you. Left - A variety programme for the 14th of June, probably 1909, at the Gaiety Theatre, Birmingham - Courtesy Lynn Stratton. See cast details below. I have to thank you for your kindness in coming here, and I hope you will join me in giving thanks to the various people who have been identified with the building of this place. First and foremost are the architects, Messrs Crouch and Butler; also Mr William Hope, the eminent architect of the north; also Mr S. A. Davidson, the contractor of the north; and Messrs A. R. Dean, of Birmingham, whom you ought to be highly proud of. Messrs Dean have done all the plastic and decorative work, and have also supplied the handsome furniture which you see. I must also mention Messrs Verity, who have furnished the electric light installation, and other people who have identified themselves in various departments. 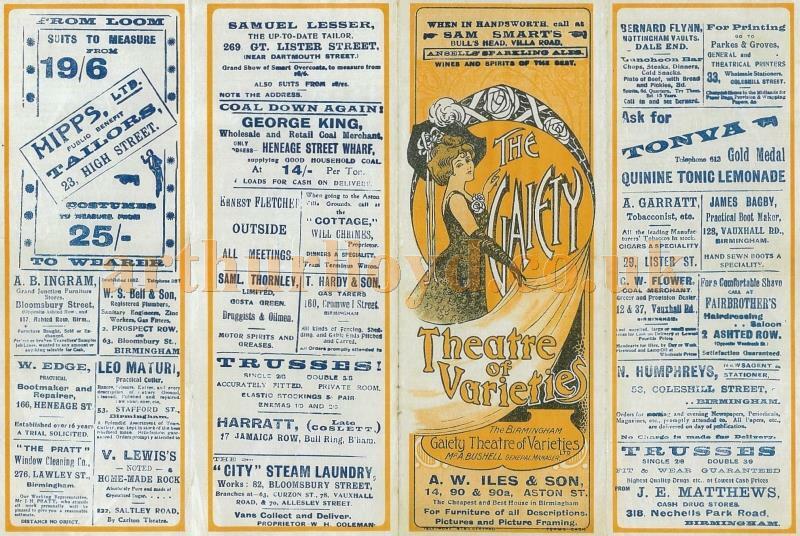 Right - A variety programme for the 7th of July 1902 at the Gaiety Theatre, Birmingham - Courtesy Lynn Stratton. See cast details below. The programme to-night is not perhaps as good as we could have wished; but in the course of a month or two we intend to provide you with the best talent that can be got in the market. As a matter of fact there was little reason for Mr Weldon Watts's apology for the programme. It included that talented artiste Miss Katie Lawrence, whose turn was enthusiastically applauded. The above text in quotes was first published in the ERA, 13th of November 1897. 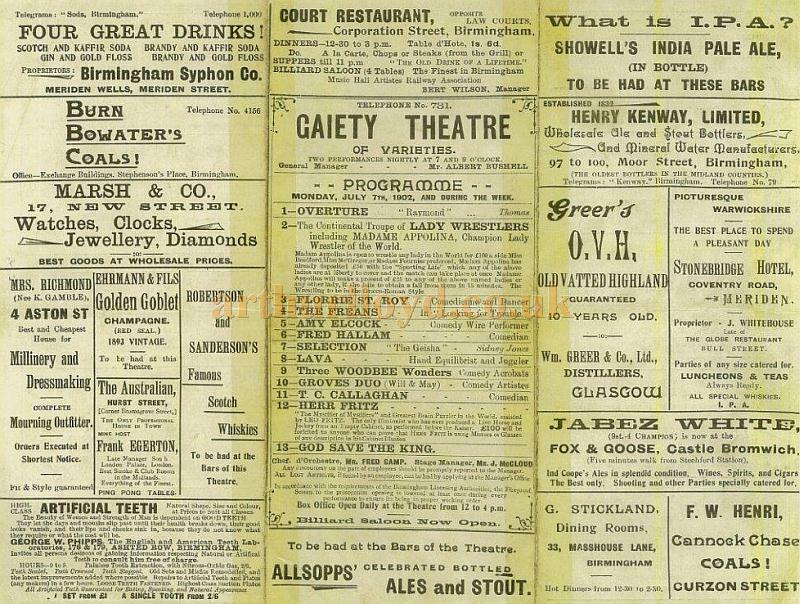 Above - A variety programme for the 7th of July 1902 at the Gaiety Theatre, Birmingham - Courtesy Lynn Stratton. On the Bill were The Continental Troup of Lady Wrestlers with Madame Appolina, and also Florrie St. Roy, The Freans, Amy Elcock, Fred Hallam, Sidney Jones, Lava, the Three Woodbee Wonders, Groves Duo, T. C. Callaghan, and Herr Fritz. Above - Details from a variety programme for the 14th of June, probably 1909, at the Gaiety Theatre, Birmingham - Courtesy Lynn Stratton. On the Bill were John Clempert, The Eeduns, Cribb & Cribb, Onda & Artell, Willie Stopit, The Davenports, Madoline Rees, The Saletos, Horace & Olgar, and the Gaietoscope. In 1910 P. D. Elbourne became the manager of the Gaiety Theatre, and in 1912 T. Allen Edwardes took over the reigns. The Theatre had always been a popular music hall producing productions which were held in high esteem by the Birmingham populous. The Theatre had its own organ, played by one Mr. Sola and it is said that the Theatre's patrons were expected to be properly dressed and sporting top hats before they would be admitted. 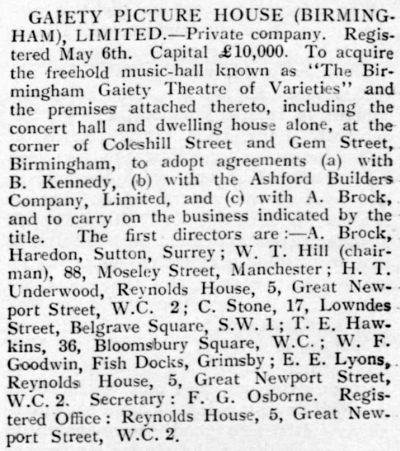 Right - Details of the proposed Gaiety Picture House - From the Bioscope, 22nd of May 1924. The Gaiety Theatre finally closed however, in 1920 whilst under the management of Ben Kennedy. The Theatre was then turned over to Cinema use, known as the Gaiety Picture House, which would run as such until it was closed after an explosion in the projection box on the 2nd of September 1936. The building was later demolished in mid 1938 and then rebuilt the following year, to the designs of William Riddell Glen, reopening on Monday the 18th of December 1939 as the ABC Gaiety Cinema. Left - A notice from the ERA of the 25th of August 1938 on the demolition and rebuilding of the Gaiety Picture House. The Cinema was one of the last ABC Cinemas to open during the war and was only able to do so as its roof was already on when the outbreak of war was announced in September 1939. The Evening Dispatch reported on the Cinema's imminent opening, along with a photograph of its auditorium, shown right, in their 15th of December 1939 edition saying:- 'When they open this Cinema it will revive Music-Hall memories. Birmingham's Gaiety Theatre, once Holder's Concert Hall, perhaps the last of the Birmingham Music Halls to have a chairman, after the good old style, is to reopen Monday next - but the heroes and heroines of the films will now flicker on the screen near where the favourites of the "Gay Nineties" once trod the boards. 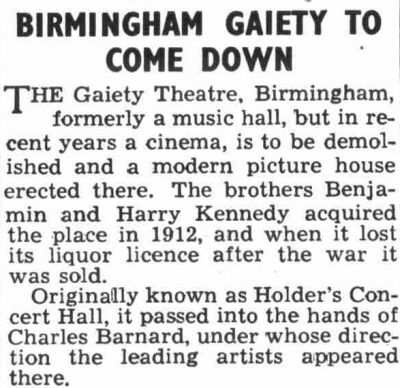 Right - The Evening Dispatch reports on the new ABC Gaiety Cinema, Birmingham on the 15th of December 1939. Since then the Gaiety had been a cinema up till the time when a mysterious explosion wrecked the operation box three years ago. Years of life as a cinema however, could not free the Gaiety from the hauntings of such stars as Vesta Tilley, Bessie Bonehill, Little Tich, and Arthur Lloyd who made the hall famous, together with the rotund old-time chairman, Harry Henrick. 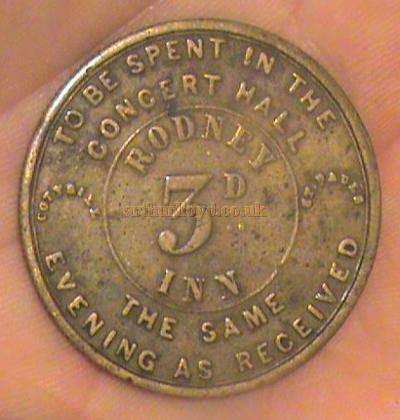 That was in the days of Holder's Concert Hall. The Gaiety, as it was later known was a stage for Charlie Chaplin (in his early days, before he became a cinema star), and such "Lions" of the halls as George Lashwood and Eugene Stratton. 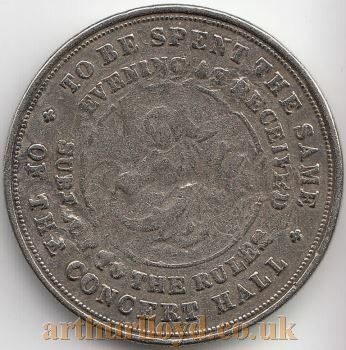 Florrie Forde, "The Great Carmo", G. H. Elliot, were others who might have been seen for tuppence in the gallery of the old hall. The above text in quotes was first published in the Evening Dispatch, 15th of December 1939. The ABC Gaiety Cinema opened on Monday the 18th of December 1939 and then continued in operation until it was eventually closed for refurbishment in May 1963, reopening in August the same year. The Cinema closed for the last time however, on the 29th of November 1969 with a final showing of the film 'The Killing of Sister George.' The building was then demolished and the site was grassed over by the University of Aston. Some of the text on this page and the Concert Hall image was gleaned from the excellent book ' Birmingham Theatres Concert & Music Halls' by Victor J. Price. And some later Cinema information was gleaned from the excellent website Cinema Treasures.